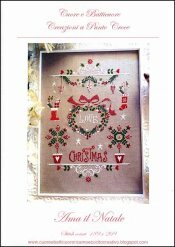 Ama Il Natale [G1809] - $14.66 : Yarn Tree, Your wholesale source for cross stitch supplies. Cross stitch pattern by Cuore e Batticuore. Who doesn't love Christmas (Ama il Natale)?!?! A Christmas wreath decorated with a big red bow & "Love", is stitched in the middle. Snow boots & Christmas stockings are filled with presents & candy canes. Flower pots & garland are decorated for Christmas. Enjoy listening to Christmas music, as you stitch this design for your mantel. Stitch count 189 x 269. Stitched on #4138 Zweigart Belfast Linen 32ct. Raw.